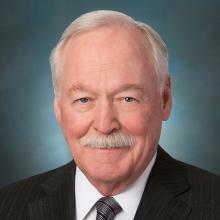 James M. Lyons is a senior partner at Lewis Roca Rothgerber Christie LLP. He is the senior trial lawyer in the firm focusing on complex business litigation and arbitration of all types, including corporate, securities, and competition law. He also has extensive government relations, international trade, and diplomatic experience. Mr. Lyons is a Fellow of the American College of Trial Lawyers, the International Academy of Trial Lawyers and a member of the American Board of Trial Advocates (ABOTA). He is a member of the Neutrals Panels of the American Arbitration Association, the International Centre for Dispute, and the International Chamber of Commerce with the International Court of Arbitration. He has served as President of the Board of the Faculty of Federal Advocates and as Chair of the Magistrate Judge Merit Selection Panel for the United States District Court in Colorado. Mr. Lyons has been listed in every edition of Best Lawyers, Colorado Super Lawyers and Chambers USA. For an unprecedented four years, he was the Top Vote Getter for all Super Lawyers in Colorado. He was named the "Alternative Dispute Resolution Attorney of the Year" in Colorado by Corporate INTL magazine in 2014. In 1997, Mr. Lyons succeeded Sen. George Mitchell as Special Advisor to the President of the United States and Secretary of State for Economic Initiatives in Northern Ireland and the border countries of the Republic of Ireland. He served in this position until 2001. He was responsible for numerous economic initiatives in support of the peace process. He also served as the United States Observer to the International Fund for Ireland ("IFI"), a diplomatic post to which he was appointed by President Clinton in 1993. He currently serves as Honorary Irish Consul in Denver. Mr. Lyons is a former member of the IAALS Board of Advisors.